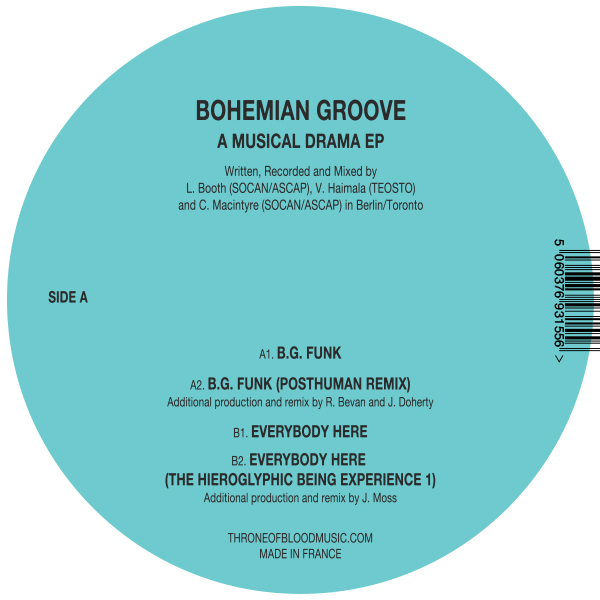 Just over a year after their debut single for Throne of Blood, Canadian/Finnish trio Bohemian Groove return with two more slices of gritty, technoid funk on "A Musical Drama." 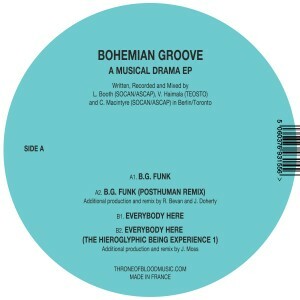 Fusing the filmic sensibilities of Toronto's Jokers of the Scene with the bugged-out vibe of Berlin's Renaissance Man, Bohemian Groove have staked out a place right at the heart of the freakiest, most forward-facing dance floors. “B.G. Funk” doesn’t waste time on a frivolous intro. Catapulting into dark techno territory, Bohemian Groove employ a hypnotic mix of broken organs, reverb tricks and distortion to deliver dance floor devastation. Offering a slight reprieve from the filth of "B.G. Funk," “Everybody Here," keeps to similar themes: noise, analog synths and FX mingle with a haunting vocal sample while syncopated breaks keep the focus on functionality in the mix. Remixes come from Posthuman, who soften “B.G. Funk” a little, with vintage drum machine grooves and squelchy acid lines. Talking about acid , an avalanche of 303’s and 808’s define Hieroglyphic Being’s extended take on “Everybody Here," which will definitely appeal to the fans of the rawest, weirdest strains of underground dance music. Completing the package is a digital-only bonus remix from two good friends of the TOB family: JDH (Fixed NYC) and his long time pal Chupacabras, who revamped “B.G. Funk” in pure analog fashion, adding their own brand of moody synths, classic drum machine funk, and 303’s.